Some 14% of U.S. adults say they have been targeted for online harassment or abuse because of their political views, according to a new report from Pew Research Center. And while Republicans and Democrats are about equally likely to have been harassed online because of their political views (15% vs. 13%), there are some notable partisan differences in their views of the issue. Americans’ attitudes toward offensive content online also tend to differ by political affiliation. The survey asked respondents to choose which statement came closer to their view: “Many people take offensive content they see online too seriously” or “offensive content online is too often excused as not a big deal.” By a 63%-36% margin, Republicans say people take offensive online content too seriously. By contrast, Democrats are more divided: 50% say offensive content is often taken too seriously, while 48% feel it is too often excused as not a big deal. When it comes to striking an appropriate balance between creating online safe spaces and allowing for free expression, Americans in both political parties have largely similar views: 52% of Republicans and 55% of Democrats say it is more important for people to feel welcome and safe online than for people to be able to speak their minds freely. But Republicans and Democrats have somewhat differing views on the role that certain groups – like online platforms or elected officials – should play in addressing online harassment. Majorities in both political parties agree that online services have a duty to step in when online harassment occurs on their platforms, but Republicans are somewhat more likely than Democrats to say digital platforms should not be held responsible for the abusive content users post or share on their sites (19% vs. 12%). Meanwhile, Democrats are modestly more likely than Republicans to say online services (68% vs. 59%) and elected officials (35% vs. 28%) should have a major role in addressing online harassment. Those in both parties hold similar views on the role that law enforcement should play in addressing online abuse. Notably, partisan differences about online harassment mirror attitudes that go beyond the online world, such as how people view political correctness and potentially offensive language more broadly. Previous Pew Research Center surveys show Democrats are much more likely than Republicans to say people should be more careful about the language they use to avoid offending people with different backgrounds and to support government intervention when offensive speech is directed toward minorities. Regardless of political affiliation, women in both parties are more likely than their male counterparts to view online harassment as a major problem, to think offensive content online isn’t taken seriously enough and to prioritize safe spaces over people being able to express themselves freely online. Still, Republican men do stand out. 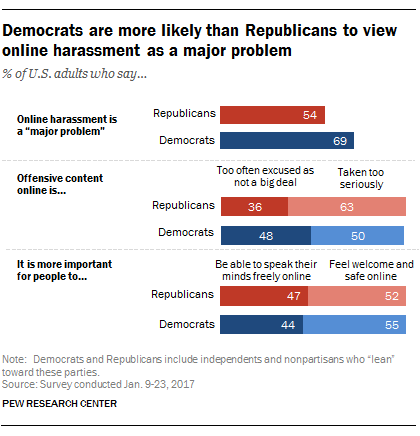 Just 45% of Republican men say online harassment is a major problem, compared with around six-in-ten or more Republican women, Democratic men and Democratic women. 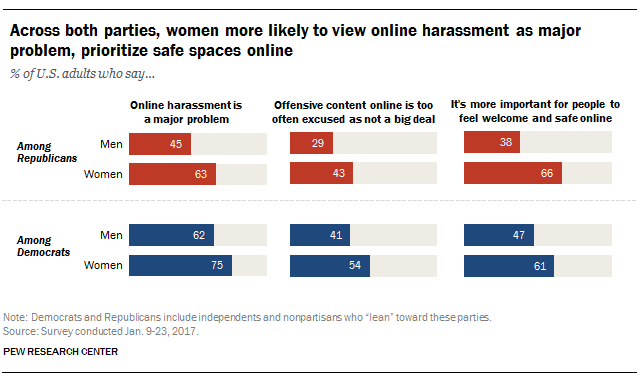 And Republican men are also less likely than Republican women, Democratic men and Democratic women to say offensive content online is too often excused as not a big deal and to prioritize creating safe and welcoming online environments.